Halfway through the season is when things begin to change drastically. Players who you thought would carry you all the way to the championship start to struggle, and others who were bringing your team down start heating up at the right time. Because of this you have to temporarily become a psychic and decide who will get hot and will not. Here are two important players who I believe you trade and sell-high on before they and their trade value cool down. Vargas is the American League leader in ERA and wins (John Sleezer/Kansas City Star). Jason Vargas is one of the many surprise elite pitchers this season, and will soon be one of the many to start declining. I’m only saying this due to the fact that Vargas has been in the league for almost a decade and has never performed like this before. Vargas has typically been a mediocre starter that is in-and-out of the Major leagues, with his career ERA still being 4.03 despite leading the league in that very stat this season. Another downside to Vargas besides his lackluster career is that he is 34 years old and injury prone, with a left elbow and left flexor strain just these past two years. Another thing to consider is that despite his dominance, the Kansas City Royals hitting is atrocious, ranking 27th in baseball with 330 runs scored. Trade the risky asset that is Jason Vargas for some good pieces before his inevitable decline begins. 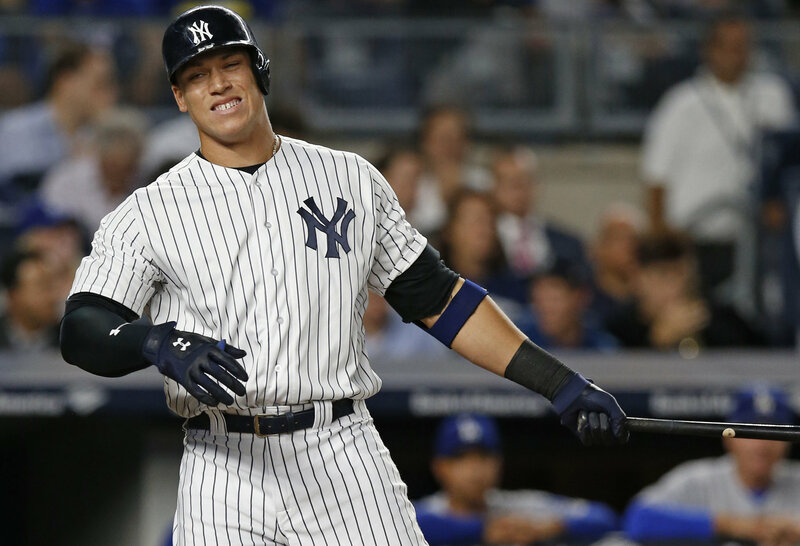 Aaron Judge is on pace to win the American League triple crown (AP Photo/Kathy Willens). Aaron Judge burst onto the scene this 2017 season, leading thee American League in homers, RBI, and batting average. In addition, he leads all MLB hitters with a 4.76 WAR. And even with this unparalleled success, we have to realize that this consistency and ability to get on base will soon end. Before his .444 on base percentage and 28.7% strikeout rate this season, he was hitting with a .263 and 44.2% clip. The power has always been there for Judge, but this sudden ability to get on base and not strikeout will be short lived. This success cannot be sustained for much longer because Judge will soon revert to striking out and being inconsistent once again. The best part about Judge is that most people won’t think he will decline, and thus you can trade him for great assets who could lead you to a championship.